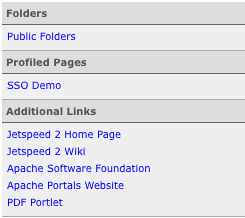 Tabbed Menus, Breadcrumbs and Menu Items are the main ways to Navigate through your portal. Edit, Help and other portlet bar action items can display different screens, but you have not navigated to a new location. Customization of all navigation items can be configured by the Administrator of the portal. Tabbed menus across the top contain selections for each page found in the current folder. The current Tabs may have come pre-configured as standard or may have been created and configured by the user. Each Tab can be configured with a different Theme, Layout, Portlet Theme and different Portlets. Breadcrumbs are located just below the Tabbed Menus. Breadcrumbs give you a visual representation of the path you have taken to reach your current location. From the breadcrumb trail, you can navigate back out of the folder hierarchy up to previous destinations. Menu Items are located in the Left Hand side menu. Each one of these links can take you to a location within the Portal or to an external location such as a website. Folders you have created will appear in this menu.